Crystal Gem is an Upgrade Material in Dark Souls 3. A gem of infused titanite. Introduced to Lothric by the Crystal Sages. Used in infusion to create crystal weapons. 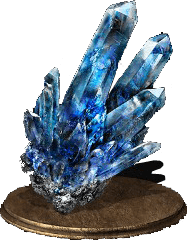 Crystal weapons inflict magic damage, and scale effectively with intelligence. Cloaked Hollows and Hollow Sorcerers in Road of Sacrifices before Crystal Sage area have a chance to drop it. Dropped by the large undead with a Great Axe, near the entrance to Cathedral of the Deep (ng+). Can be dropped by the Grand Archives Scholars and the Hollow Slaves in the Grand Archives. Dropped by one of the Great Crabs by the Depths of the Painting bonfire. Despite its name it has nothing in common with the brittle Crystal infusion of the first Dark Souls game. Quite useless cuz few enemies are weak to magic damage. Seriously? There is only one guaranteed drop for this item? Just a great early / mid game buffer on anything that has something to do with magic. The ol&apos; reliable. If I have 50 int, 30 faith, am i better off with a crystal longsword for int scaling only, or dark / chaos for int and faith scaling? I got a drop from a Grand Archives Lothric Knight who had a crystal magoc weapon effect on his sword. •Dropped by the large undead with a Great Axe, near the entrance to Cathedral of the Deep (ng+). You don t neet NG+ and Undead with a Halberd dropped too. Important note for any fledgling caster looking at this/chaos gem/etc vs weapon buffs: Flat means *flat*. Crystal Magic Weapon looks impressive on the status sheet but doesn&apos;t multiply with critical or even charged r2. My buffed raw rapier at an impressive 538 AR only did 740 on a backstab, vs crystal rapier at a humble 424 doing 1027. Crystal Dagger +10 can easily do 1.3k-2k on a critical hit depending on how much you RTSR etc up, and at 60 int can one-shot King of Storms (NG) off a *regular* Soul Spear stagger. Buffs are optimal for r1/l1 spam (and even then only by a smaller margin than people rage quit Soul Spears over) and for physical builds with a buff supplement. But for any caster base, infusion is going to be better in just about every way. ive killed the hollow sorcerers so many times, all they drop is sorcerer staff, its not a ng is it? In farron keep, before the sage, the undead magic users. Are the Crystal GemsI.Could.Not.Resist.Forgive me. So we get only 1 guaranteed drop for NG ? Thats *****ing retarded. Which infusion path would be best for scaling? Crystal or simple? I had one drop in Cathedral of the Deep I forget which mob but it&apos;s probably as rare as Crucifixion Woods for the drop rate. I forget which mob dropped it, but I&apos;d say if you&apos;re looking to farm a few Crucifixion Woods is still the better spot to do so. The spearwielding hollow before the room with the two sorcerer hollows dropped one for me. I was using the Crystal Sage Rapier.